Moscow: Two Russian Sukhoi Su-34 bombers accidentally collided over the Sea of Japan during a training exercise on Friday, with two pilots from the downed aircraft rescued from the sea in a "satisfactory" condition, the country's Defence Ministry said.The planes of the Russian Air Force collided while manoeuvring over the Sea of Japan at 8.07 a.m. (Moscow time). The ministry said in a statement that the planes performed the flights without ammunition. Following the collision, one of the fighter jets with two pilots crashed into the sea, while two pilots of the other plane ejected from the aircraft, Xinhua news agency reported citing the ministry's statement.The pilots controlling the downed aircraft landed in the freezing cold waters of the Sea of Japan, but were both rescued in a "satisfactory" condition, according to the Defence Ministry. 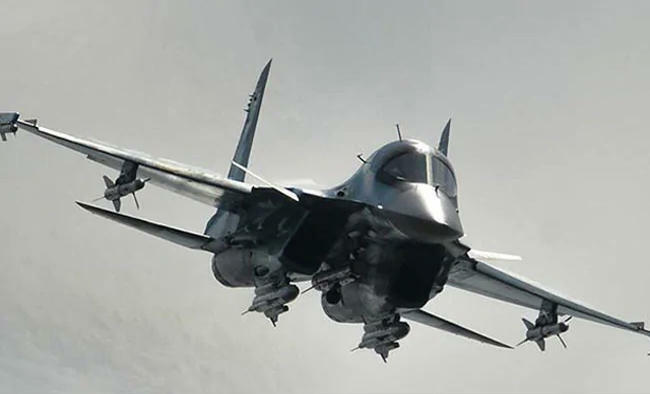 Meanwhile, the other two pilots flying the second aircraft managed to land safely, having sustained engine damage in the mid-air accident.The Su-34 is an all-weather supersonic medium-range fighter-bomber. It first flew in 1990 and has been in service with the Russian Air Force since 2014.